Have you ever untagged a photo of yourself on social media because you didn’t like your smile? According to a recent national survey conducted by Invisalign®, 57% of Americans feel self-conscious about their teeth. The fact is that most people aren’t born with a picture-perfect smile. But that doesn’t mean your dream of a healthy, straight smile is out of reach! With a little help, teenagers and adults alike can find an option that fits their needs. 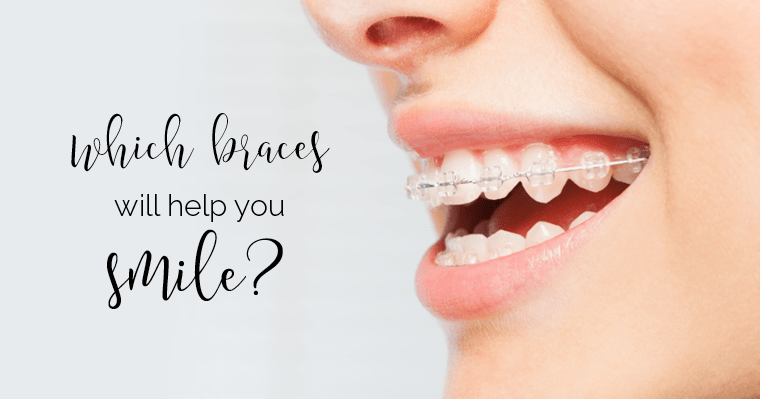 But how do you choose the right braces for your smile? 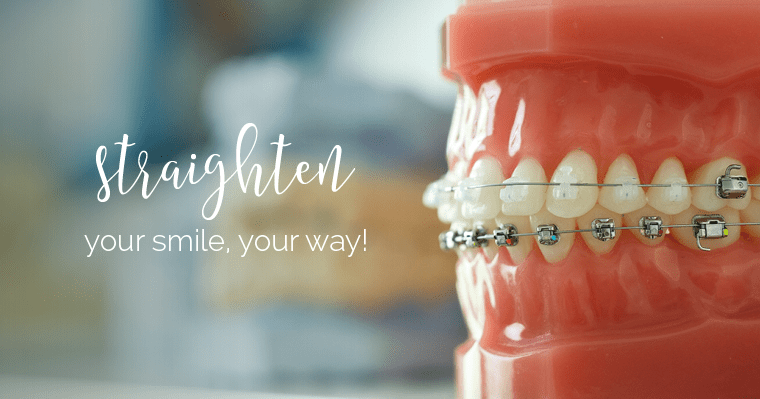 Proceed to step two to choose the right braces for your smile. What did you consider as the most important factor when thinking about straightening your smile? Keep that in mind when considering the pros and cons of each of the major types of braces. Although we call them “traditional,” the technology behind metal braces has come a long way since the days of headgear. Metal braces are fabricated from high-grade stainless steel that forms brackets attached to each tooth. Small elastics (or o-rings) connect a thin archwire to the brackets. Your dentist tightens the archwire periodically, and at the same time replaces the elastics, applying pressure to your teeth to prompt them to move slowly into position. There are some brands, like FASTBRACES® or Damon Braces, that adapt the fundamental technology behind traditional braces to speed up the process. PROS: Excellent for more complex tooth and jaw issues. Colored elastics are available for self-expression. Least expensive type. If visibility is a factor for your orthodontic treatment, ceramic braces may provide a reasonable alternative. With ceramic braces, the brackets are made from a clear, transparent material. The braces are less visible to others, which makes them a popular choice for adults who need orthodontic treatment. PROS: Less visible than metal. Maybe faster than clear aligners. CONS: Elastics can become discolored or stained. Ceramic is more brittle and prone to breaking so it is not recommended for severe cases. More expensive than metal braces. A clear aligner system of orthodontic treatment, like Invisalign® or ClearCorrect, is best for those who are concerned about appearance. The patient replaces a custom-made aligner tray every one to two weeks. Aligners can be removed for special occasions, oral hygiene routines, and eating or drinking (anything other than water). PROS: Ideal for image-conscious patients. Easy to maintain oral care. Accelerated options available. CONS: Not the best option for more serious orthodontic issues (although there are providers who specialize in more complex cases). Must wear trays for 20-22 hours a day. Not available for pre-teens. What type of braces or brands does this dentist use and why? Is this dentist using the latest technology available? How many successful cases has he/she completed? What special training or recognition has he/she received? Does he/she offer accelerated orthodontics if time is a factor for me? Be an educated consumer and do your homework. Visit several dentists in your area to find one that listens to your concerns, offers a customized treatment plan, has an excellent reputation, and fits your budget. Many dentists will offer a complimentary consultation to discuss your smile options. Congratulations! You are on your way to the smile of your dreams! Get ready to smile confidently and show off your perfectly aligned pearly whites at every opportunity. As you can see, there are many factors involved in choosing the right braces for your smile. But it’s worth all the effort. Discover your true smile potential by learning more about the cosmetic dentistry treatments available at your local dentist today!